Published four times a year, the International Journal of Comparative Labour Law and Industrial Relations has become established as the major English language publication in its field. The Journal publishes original articles in the domains of labour law and industrial relations – interpreted broadly and dynamically – and aims to deal with countries from all over the world. Articles cover comparative and international (or regional) analysis of topical issues, major developments and innovative practices, as well as discussions of theoretical and methodological approaches. The Journal adopts a double-blind peer review process. A distinguished editorial team, with the support of an International Advisory Board of eminent scholars from around the world, ensures a continuing high standard of scientific research dealing with a range of important issues. As a result, the Journal is an essential source of information and analysis for labour lawyers, judges, policymakers, personnel specialists, international law firms, trade unions, multinational organisations, academics and libraries. 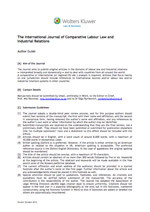 For more information about the International Journal of Comparative Labour Law and Industrial Relations please visit the journal web page at IJCL. 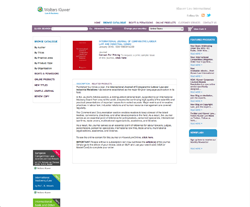 Abstracts and PDFs of all issues can be found here. Please click here or contact our sales department to place an order or to obtain further information.